Goddess Kali is one of the many forms of Maa Shakti. 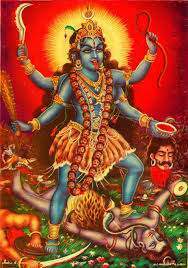 Goddess Kali is sometimes referred as the goddess of death. But actually Kali brings the death of the ego. In tantra sadhna, a sadhak consider mahakali to be more influential and powerful giving immediate results. The aspirant sadhak, having perfected this Sadhna get all Ashtsidhis. This Sadhna evokes innumerable advantages which are realised instantly after the accomplishment of the Sadhna. One can attain her blessings by worship of Parad idol. 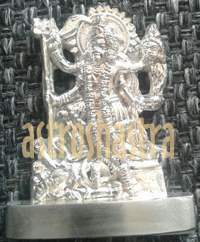 Goddess Kali is pleased by chanting mantras, doing worship either on the image, or by the help of Kali Yantras (mystical diagrams) and by certain rituals and offerings etc .Ones goddess Kali is pleased then all the aspirations of man gets fulfilled. Ma gives everything to the sadhak in this world. People who are attached to their ego would not be able to receive the idea of Kali and she will appear in a wrath form to them. But people, who are engaged in spirituality, removing the illusion of the ego, will find Maha Kaali in a different form like sweet, affectionate, and overflowing with perplexing love for them.